Apart from the waste in the food supply chain, overeating is gradually becoming a serious public health issue in a growing number of countries. In Europe, an estimated 50% of the food produced is wasted. This changes from country to country and from sector to sector, but in the best case scenario not less than 20% of our food ends up as waste. At the same time, more than 50 million Europeans are at the risk of poverty. This is simply unacceptable from a social, economic and environmental standpoint. In Sweden, an average household is estimated to throw away 25% of food purchased. An average Danish family with 2 adults and 2 children wastes food for 1.341 € a year (2.15 billion € for the whole country). In Italy, about 20.290.767 tonnes of food waste are formed every year along the whole supply chain. Each French citizen throws away every year 7 kilos of food still in the original package, when in the same country, 8 million people are at risk of poverty. Simultaneously, studies show that western countries are consuming every day a surplus of 1400 calories per person for a total of 150 trillion calories a year. So, apart from the waste in the food supply chain, overeating is gradually becoming a serious public health issue in a growing number of countries. From the environmental perspective food waste accounts for more than one quarter of the total consumptive use of finite and vulnerable freshwater and more than 300 million barrels of oil per year. Moreover each tonne of food waste generates 4.2 tonnes of CO2. How is food waste generated? Among the many several reasons we find that packages are too large for small households, that the portions prepared for each meal tend to be too big, failed preparation of the recipe, incorrect transport, fear of deterioration caused by the proximity to the expire date, not wanting to eat leftovers from the previous day, bad refrigerator… Nothing that can’t be fixed. Like with any other process human beings have to learn to manage this resource named food. In the past a lot less food was wasted; the wastage started 50 years ago with the over-abundance of products and very low cost of disposal; this caused that Europeans paid less attention to the food waste they generated. Times have changed; overabundance times are over and the costs of this irresponsible and inefficient behaviour are increasing. The world population has grown tenfold and hunger is still persistent and growing –also in Europe-, the EU has constant and unsustainable yearly deficit of 75 million tons of biomass with the rest of the world, the costs of disposal for waste continue to increase and EU legislation pushes in prevention. Much of the food wastage can be reduced with the right prevention policies and campaigns to make sure that what would otherwise be waste can be still eaten or reintroduced in the system. Measures as simple as changing the size of the portions, supplying food in smaller packages (beware of the packaging waste), training young people in how to preserve food, etc… are part of the tool-box we need to address the problem. In this direction, it is to be welcomed that on the 28th October 2010 the agriculture committee of the European Parliament approved a joint declaration against food waste in which they were asking for a reduction of 50% of the amount of food waste throughout the food chain. Unfortunately the Environment Directorate of the European Commission still hasn’t considered appropiate to include neither waste prevention targets nor recycling targets for biowaste in EU legislation which is stopping the EU from making major shift forward in the reduction of food waste. In the future it will be necessary to work at European, national and local level in order to reduce this big sign of unsustainability and inefficiency that is food waste. 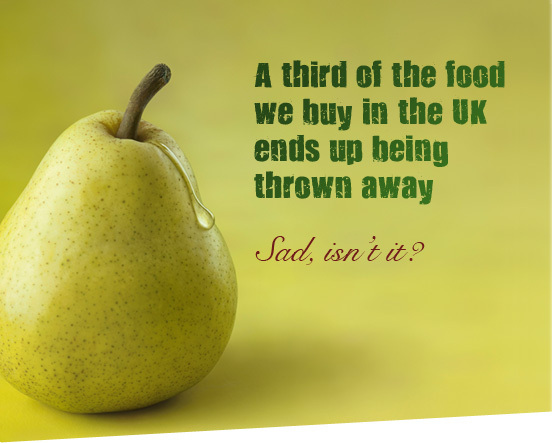 In Britain every year 18 million tonnes of food still perfectly edible are thrown away (WRAP) by households alone for an annual retail value cost of 14 billion pounds: at the same time 4 million people in the UK do not have access to a healthy diet. The environmental implications of stopping to produce food waste would have a CO2 equivalent of taking 1 in 4 cars off the road. For this reason WRAP launched the campaign “Love Food – Hate Waste” in 2007 which by January 2009 was already a success in making 2 million UK households take steps to reduce food waste: this has stopped 137,000 tons of food from being thrown away which prevented 600,000 tonnes being emitted and resulted in a saving of nearly 300 million £ . The Netherlands is throwing away 2.4 billion € per year on food waste, that is more than 400€ per household representing more than 20% of the total food in the market. For this reason the Dutch government has committed to reduce by at least 20% the food waste by 2015. To achieve this goal and following the example of the successful initiative in the UK the campaign “taste the waste” has been launched in which they teach how to save money without too much extra effort. Lundqvist, J. 2010 ’Producing more or Wasting Less. Bracing the food security challenge of unpredictable rainfall’.